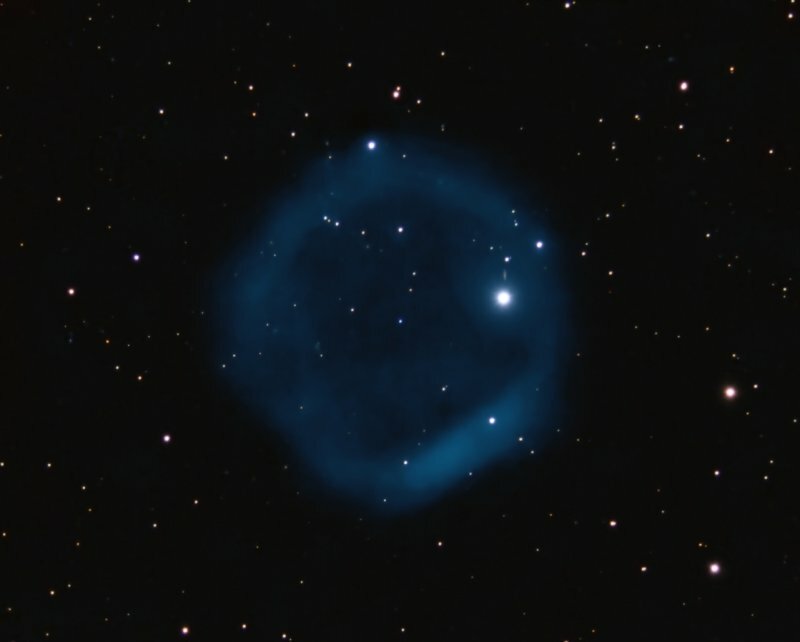 Jacoby 1 is one of the faintest planetary nebulas in the sky. It was discovered by George Jacoby in 1993. Nebula is OIII mapped to teal blue, stars are RGB. Exposure: Total exposure time about 25 hours, 65 x 20 mins OIII, 35:24:35 x 2 mins per channel RGB. All bin 1x1. Captured over about 15 nights from January to April 2018. Colorized OIII to teal blue in PixelMath: mapped 0.067 to R, 0.7*OIII+0.03 to green, and OIII*1.3 to blue. Wow you make it look so bright!